In this article we’re going to look at program managers and the effort and influence they exert as the program they are responsible for is executed. Once we understand this, we’ll compare program managers against leaders and against project managers, observing any differences. Take a look at the effort and influence diagram below for a program manager. Time is on the horizontal axis, and the vertical axis runs from low to high for lines plotted. The lines we’re plotting against these two axes are obviously effort and influence. In the diagram above you can see that the program manager’s ability to influence the outcome of the program is greatest at the beginning of the program. You can also see that the effort the program manager expends during the program is high but consistent over the entire duration of the program. Note that there are no precise values on the vertical axis, so I am not saying influence exceeds effort at the start of the program, merely that both are high. Now let’s plot a similar graph for a leader/senior executive. As you can see the curve for ability to influence the outcome looks very similar to that of the program manager. It’s impossible to say whether the senior executive or program manager has a greater ability to influence the outcome at any given time. On the one hand the leader may have a higher rank within the organisation, but on the other the program manager is very close to the program and knows it better than anyone. 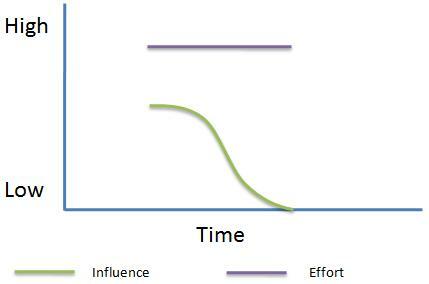 The key point here is that for both the program manager and the senior leader the influence curves follow the same trajectory. The effort the leader expends on the program will rarely be huge, but will be greater at critical points within the program when troops need to be rallied and other senior executives need to be persuaded to come into line. Now let’s plot the same graph for a project manager. In this example we’re assuming that the project manager is not involved for the entire duration of the program, although they could be. Instead they are involved for a subset of the program, but for the entire duration of the project for which they are responsible. As you can see, once the project manager becomes involved in the project they expend similar amount of effort for the duration of their project as a program manager does on their program. As you might expect, they have less ability to influence the overall program than either the program manager or senior executive. They are more likely to be able to influence the outcome of their project. 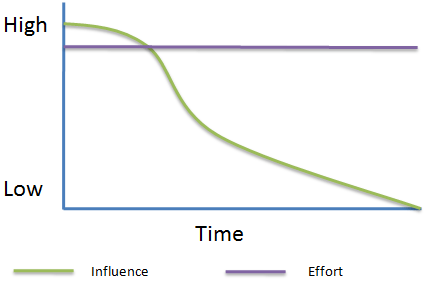 Notice that the influence curve has the same shape as the program manager’s and leader’s influence curve, but starts from a lower level of influence and ends when the project is complete, as opposed to the program. As can be seen from the three diagrams above, project managers, program managers, and leaders have the ability to influence a program in different ways, and by varying degrees. They will also expend time working on the program to varying degrees. The above diagrams should help you understand more clearly the differences between the three roles.